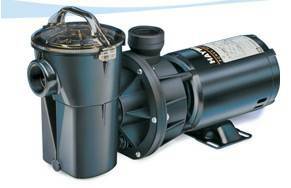 These heavy-duty pumps are versatile and durable backed by decades of proven performance. Clear cover lets you see when basket needs cleaning . Heavy-duty, high performance motor with integrated automatic thermal overload protector for maintenance-free operation. Heat-resistant, double-sized seal. Long wearing and 100% drip-proof. For fresh and salt water use. Durable, corrosion-proof housing made of high performance reinforced thermoplastic material for years of dependable service and all-weather performance. Clear "see-thru" cover lets you see when basket need cleaning. Over-sized strainer basket has extra leaf-holding capacity that will extend time between cleaning. Integral drain plug for easy maintenance of pump. Maximum performance Noryl impeller with extra-wide openings to prevent clogging by leaves and debris.